The power generated by your Nissan vehicle relies on the air that enters the engine. Engine air filters are made to last but various conditions like driving in the dirty air can quickly clog your filter in just a few months. Other drivers often find that their Engine Air Filter lasts much longer. Due to the unpredictable nature of how long your Nissan Engine Air Filter will last, it is always best to have it inspected regularly to prevent airborne contaminants from entering your engine to cause damage and expensive repairs. If you are experiencing any of these warning signs, it is important to have your Engine Air Filter inspected now. Want a High-Performance Nissan Engine Air Filter Upgrade? If you want to upgrade your Nissan’s performance, it is always a great value to consider a high-performance version of your Nissan Engine Air Filter. Unlike the average paper versions, higher performance versions use cotton instead of paper that is stretched over wire mesh to improve reliability and durability. Cotton is better because it improves both airflow and filtering contaminants. You’ll also be interested to know that the high-performance Nissan Engine Air Filters are REUSABLE, saving you money in long-term replacement costs. When the performance Nissan Engine Air Filter gets dirty, it’s easy to remove and wash it to restore it to brand new condition. Reusable Nissan Engine Air Filters will never need to be replaced and will last the entire life of your vehicle. If you have any of the signs related to a faulty engine air filter, it is time to schedule service before your engine has major problems. Schedule an appointment today at Lang Nissan at Mission Bay to have one of our factory-trained Nissan certified technicians inspect your Nissan Engine Air Filter and replace it with a genuine Nissan approved Engine Air Filter. 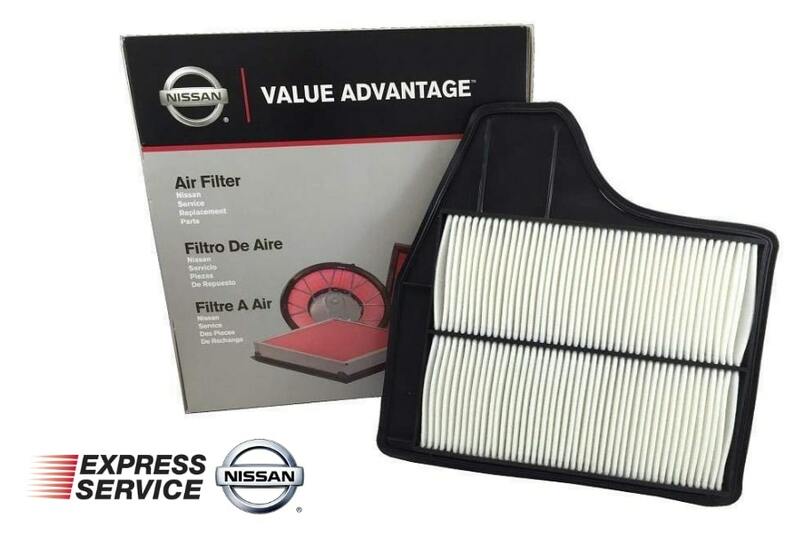 At Lang Nissan at Mission Bay, we only rely on genuine Nissan approved Engine Air Filters because that is the only way to get a fit and performance guarantee.